The state senator from the Westside’s 40th district lost to Rawlings-Blake in 2011. How she fits into the saturated field of 2016 hopefuls. 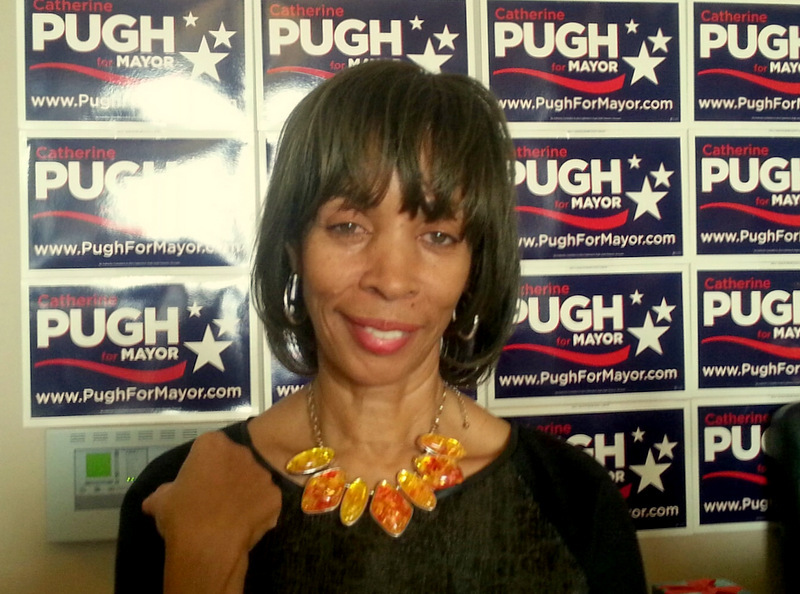 Above: Catherine E. Pugh in her campaign office today. Calling herself “the walkaround mayor” who will meet constituents “from the [boardroom] suites to the streets,” State Sen. Catherine E. Pugh officially opened her campaign office in Mount Vernon today. “I don’t think anybody in this race has the depth and breadth of experience that I have. I am more prepared,” she told The Brew as scores of supporters attended her headquarters opening on North Charles Street. The 65-year-old, who ran a distant second to Mayor Stephanie Rawlings-Blake in the 2011 Democratic Party primary, had made it clear for many months that she planned to run for mayor again. Today she said she will officially file her papers next month as a mayoral candidate in the Democratic primary. The primary will be held on April 26. For the last 50 years, whoever wins the Democratic primary has become Baltimore’s next mayor. With Rawlings-Blake saying that she will not run for reelection, the Democratic primary has become saturated with candidates. Among the hopefuls are Sheila Dixon, who resigned as Baltimore’s mayor in 2010 following a corruption conviction; City Councilmen Nick Mosby and Carl Stokes; former city prosecutor Elizabeth Embry; and private equity manager David Warnock. Pugh pledged to use her experience as a businesswoman to lure more companies to Baltimore and her years as an educator to improve the reading skills of young children. She is CEO of C.E. Pugh & Co., a public relations consulting firm, and owns a clothing consignment shop in Pigtown. According to her official biography, she was a former dean and director of Strayer Business College (now Strayer University), founder of the Baltimore Marathon, founder of the Need to Read Campaign, and is an assistant professor of business at Morgan State University. In a 20-minute speech, Pugh offered few specifics and many sweeping ideas. They included building on the city’s assets, eliminating food deserts, developing a long-term plan for the city, lowering the auto insurance rates that city drivers are charged, and creating jobs both as an economic development tool and crime reduction policy. In elective politics since 1999, Pugh has served on the City Council and in the Maryland House of Delegates. In 2007, she won the 40th District seat to represent Baltimore’s Westside in the Maryland Senate and has become a prominent player in Annapolis as Senate majority leader and past chair of the Black Caucus of Maryland. To finance her campaign, Pugh has some money in the bank. Her last campaign statement, dated January 2015, reported a cash balance of $114,225 that included a $11,000 loan to herself for her 2014 Senate run. Among her 2014 campaign backers were financier J.P. Grant (a major supporter of Rawlings-Blake in her 2011 mayoral run), P&J Contracting owned by “Demolition King” Pless B. Jones, and Murphy, Falcon & Murphy run by William H. “Billy” Murphy, the lead attorney for the Freddie Gray family. While a decent start, Pugh will need several times that amount of cash to beat Dixon, currently considered the front runner, and vie successfully against several other candidates with access to deep pockets.